Increased life expectancy and financial pressures are shifting the age profile of today’s workforce. Published in December 2016, the British Social Attitudes Survey for 2015 states that while nearly two-thirds of employees still expect to retire in their 60s, 17 per cent expect to be in their 70s before they stop work. In fact, according to a report in The Economist*, between 1995 and 2015, the number of working people aged over 65 more than doubled, to over one million and it is estimated that by 2020, one-third of the workforce will be over 50. A major contributory factor behind these figures is Government policy which is keeping more people in work. Since 2006, it has been possible to continue working while drawing a state pension and the age at which that pension can be drawn is due to rise to 66 by 2020 and 67 by 2028 with many expecting this to be nudged to 70. Many people want to carry on working and many, for financial reasons, need to so companies are now actively courting older workers. Older workers are often praised for their reliability, experience and loyalty and for the ‘soft skills’ in areas such as customer services. While we can expect a growth in the desire for paid employment among the upper age group, more people with physical impairments are now seeking employment opportunities. This is driven by the government encouraging both employers and employees to find roles where disabilities may no longer be a barrier to earning. There are nearly seven million people with disabilities of working age in the UK. Government figures have reported a steady rise in the numbers employed. In 2016, the UK employment rate among those with permanent disability and of working age was 46.5 per cent ie 4.1 million. According to the Papworth Trust, only 17 per cent of people with disabilities were born with their impairment - the majority acquiring their disability during their working lives. It is estimated that five out of six people retain their job after their first year. For people with disabilities and, to a greater or lesser degree, older workers, accessibility to the workplace is a key issue. When considering this, we tend to think in terms of ensuring that people can get into and move safely around the workplace. Building design is adapted to incorporate ramp access, wider doorways for wheelchair access and passenger lifts – all of which provide valid solutions for accessibility. They don’t necessarily, however, look at how people can get out of a building in an emergency. Under the Management of Health and Safety at Work Regulations 1999, employers also have a duty to assess workplace risks to the health and safety of employees and put in place appropriate procedures to be followed ‘in the event of serious and imminent danger’. Put simply, it is not enough to ensure that your building is accessible – you also have to make sure it can be exited safely by all employees in an emergency. In law, under the Fire Precautions (Workplace) Regulations 1997, it is the responsibility of the occupier of premises, not the Fire Service, to ensure all workers are safely evacuated in the case of an emergency. Fire risk assessments must, therefore, take into account anyone for whom mobility issues mean that they rely on a lift to move up and down a building. The structural provision of escape – eg fire stairs or escapes - are clearly inappropriate for such people. That makes the inclusion of evacuation equipment such as evac chairs and your team trained to use them, vital. An emergency evacuation caused by a fire or security incident is, of course, a worse-case scenario. There are, however, other situations which could be problematical for people with mobility issues and which, while less serious, can have health and safety implications unless proper planning and provision is made. Probably the most common is a lift failure or power outage. While not life-threatening, these situations could be distressing for someone unable to use stairs. While colleagues may be willing to help, without proper equipment or training, there is always a risk of personal injury in such situations. The decision to install assistive equipment such as evac chairs needs to be taken on a building-by-building basis to fit the needs of each employee. Very often, when people think of ‘the disabled’, they automatically think of people in wheelchairs. In fact, under the Equality Act 2010, a ‘disabled person’ is defined as someone with a physical or mental impairment which has a ‘substantial’ and ‘long-term’ effect on their ability to do normal daily activities such as descending stairs unaided. Equally, there are some medical conditions that, while they do not qualify as disabilities, can impede mobility. With an older workforce, given national statistics, it is almost inevitable that a percentage will suffer from osteoarthritis (figures show that 33 per cent of the population aged 45 plus have sought treatment for the condition). While these and other age-related conditions could impact on someone’s physical capabilities in terms of mobility, they certainly shouldn’t be considered a bar to employment on health and safety grounds. 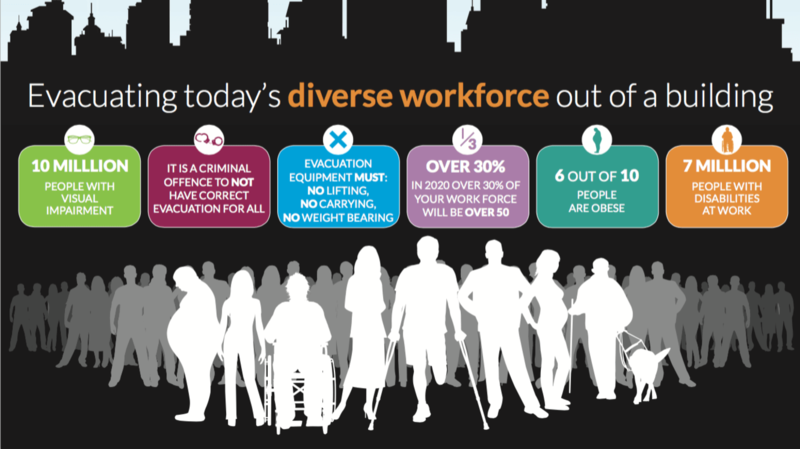 Evac chairs offer a simple and effective solution to ensure a safe exit from work for an increasingly diverse workforce.